Android App Development for Beginners course ensures that you imbibe the basics of app creation in Android, and publish the apps in Google Play Store. The course covers all the concepts of Android basics, will take you through Android architecture, and provides hands-on training with 2 popular basic apps developed within the course. Anyone who is keen on creating their own Android apps should go for this course. This course is ideal for every individual who wants to learn android app development basics and build a successful career in mobile app development. Why should I learn Android app development? Android is one of the biggest platforms for programmers today with its market share being more than 82% (Source: Gartner research). The demand for skilled app developers is high due to the paradigm shift of user behavior towards mobile. Additionally, all the new age companies consider mobile app as the primary platform for their businesses. Whether you are a student or an IT professional, this course is the best way to learn android app development if you want to get into the exciting career in mobile app development. You need to know the basics of Java/Programming to take up this course. What are the apps that you develop within the course? Calculator: You will build a simple calculator app using which you can perform all the basic calculator functionalities like addition, subtraction, multiplication and division. Stop Watch: Stop watch app is one of the popular apps on Android which is being used by millions of people with Android. You will build this app within this course which is simple and easy to use as a practical timer for any task that involves timing situation. You will be working on an app based project – Media player app in which you have to connect with the music content in the device to read & select the audio to play. You should be able to pause the music as well and continue with new selection. Source code has been provided in the LMS for your convenience in completing and validating your project. Is there any certification exam for Android? No, there is no certification exam that is accredited for Android app development. Your published apps which depict your app development skills serves the purpose of real certificate. The trainer is excellent, he is very passionate about android, and always goes above and beyond to teach the concepts. It's the best course for beginner developer in android. I had an interest to publish Apps and had no idea about the app development. A colleague at work recommended this course as it was for beginners and I found the course to be informative, and it was set at a very comfortable pace. You can revisit the topics as well, and the course has a practical approach to help develop apps. I wanted to learn about Android Programming, and it was good that content is designed at a very introductory level. The basic fundamental concepts were explained in detail, it helped a lot as I had no previous knowledge in this field. I am now confident in this topic and highly recommend it to anyone who is new to Andriod App Development. All the factors involving the development of an app were covered in the course, so when I tried to create an app – these tidbits helped a lot. The course sheds light on the fundamentals and has a good practical approach towards the development of Android apps. As a new bee in this field, I have come a long way in development of apps. Thanks to Simplilearn’s course – highly recommend it. Simplilearn Courses are just so amazing! I have enrolled for the Android application development for beginners and the course has helped me build skills & learn new concepts in-depth. The Android course was offered free with the Java Essentials course. Talking about the customer support, Simplilearn a big thumbs up. Thanks a lot Simplilearn, things are now simpler for me. I highly recommend this course to all who want to learn the basics of Android Programming, especially if you are new to this field. The apps developed during the course helps lay a strong foundation and gives confidence when you try to create an app on your own. The strong basics helped me to learn advanced concepts, and even though I was new to Java, the java essentials covered here was beneficial. Although I was new to Android App Development, this course provided a solid foundation. I am really excited about the fact that, I developed an App in less than 6 hours! Keep up the good work Simplilearn! The below system requirements are to download Android SDK (Software development kit) and Android Studio so that you can gain maximum value from the course. How will I get hands-on experience along with the course? 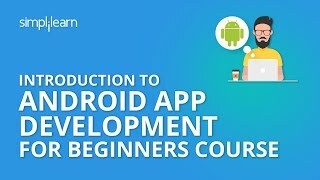 You will be creating apps within the course curriculum of Android App Development for Beginners and also learn how to upload the apps into Play Store that gives the hands-on experience required to explore the app ecosystem. Android App Development for Beginners course is currently being offered for online self-learning only so that you can complete the course at your convenience. Yes, we offer course completion certificate after you successfully complete the Android App Development for Beginners training program.